No matter what type of project you are working on, our selection of kraft and tissue paper is sure to help you find what you need. These products are made from a durable material that is suitable for a variety of tasks, including assembling presentation materials or bulletin boards. Additionally, this product is ideal to use in place of a traditional tablecloth when you need to protect your classroom tables during activities like painting or coloring. Also make sure to check out other great items from Pacon. Whether you are working in a classroom, an art studio, or an office building, this kraft paper and tissue paper can help to elevate your project to the next level. With the versatility of this paper, you can accomplish a number of projects with pen, charcoal, marker, paint, and more. 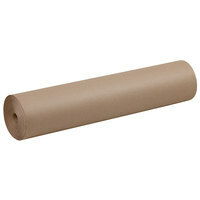 Some of these paper products are offered in rolls so that you won’t run out of paper in the middle of your assignment. For related products, check out our cards and stationery, drafting supplies, and scissors and cutting tools. If you're wondering where to buy kraft and tissue paper, we have a large selection of kraft and tissue paper for sale at the lowest prices.